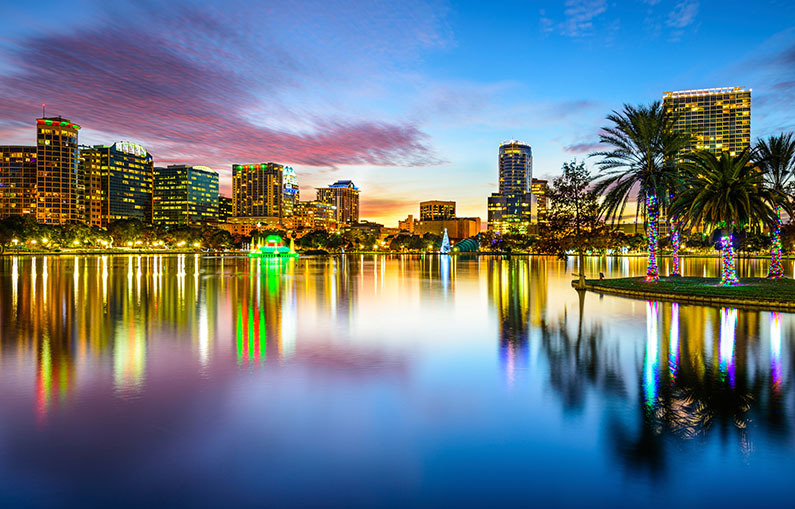 Home to hot weather, raging roller coasters, and America’s most beloved mice, Orlando is the soul of central Florida. Beyond the bustle of Orlando’s many theme parks, visitors can find gorgeous gardens and buzz-worthy nightlife. With more than 62 million visitors each year, the Sun Belt city is apt to deliver on entertainment (and sunshine). Travel the world without ever leaving Orlando. Epcot Center transports visitors to every corner of the globe, and hosts over 11.2 million visitors annually. If you’re around during the fall, be sure to check out the International Food and Wine Festival, tiring feet and filling bellies since its inception in the late ‘90s. A massive playground of imagination for grown-ups and kids alike, Universal Studios requires a plan. With three different theme parks to choose from, the experience can be overwhelming, though it’s definitely unlike any other vacation. Where else can you waltz through the Wizarding World of Harry Potter, ride “The Hulk,” and visit the Simpsons’ hometown? Experiencing a bit of theme park fatigue? The Harry P. Leu Gardens could be just what the doctor ordered. These enchanting gardens are the ones for which crayon colors are named—full of dazzling blues, shocking oranges, and sunshine yellows. Situated on 50 acres of lush terrain, this historic site most notably houses forests of camellias, a plant native to eastern and southern Asia. Dubbed the “Neighborhood for Locals,” Thornton Park hosts a smattering of local businesses. Take a stroll and be transported to a European-style community, save for cobblestoned streets. With stylish restaurants and boutiques, Thornton Park provides a more sophisticated alternative to the Orlando vacationer. To plan your trip to Orlando or for an extended guide of things to do, visit the official Orlando city guide at http://www.visitorlando.com.